There’s a new single-cup brewer in town… two of them, really. But you might not notice, ’cause Keurig slipped them into production without much fanfare. 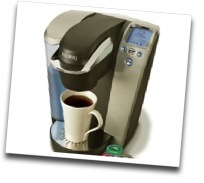 The first is an updated Keurig ‘Elite’ B40… the entry-level single cup model. The new model adds a second, larger-volume brew button to its control panel. It’s a feature probably most welcome to tea-drinkers — and it’s especially welcome for iced tea fans — as a 9.25 ounce setting isn’t one I’d recommend for getting the most flavor out of a coffee K-Cup — even an Extra Bold selection. The results? Pretty remarkable, really. I’ve been brewing coffee with one of the first production B70s daily for several weeks now, and it makes a decidedly bolder cup at all brew volumes. More, it makes a cup with more distinctive flavors, too. Green Mountain’s Extra Bold Espresso Blend now finally reveals its dry berry top note, the Extra Bold Kenyan AA offers distinctive wine and blackberry flavors, and the Extra Bold Fair Trade Organic Sumatran Reserve is at once rich, and earthy and ever so slightly mossy. That’s not to say that you have to brew an Extra Bold K-Cup to appreciate the upgrade. Whether your K-Cup of choice is a Signature Blend or a Partner Blend (PBS Blend is especially tasty with the brewing system upgrade) or even coffee from another roaster (I’m okay with that… really!) I think you can appreciate the results. And, if you’ve found yourself on the fence between brew sizes, the new brewing system may make that larger brew volume just the ticket for your tastes. So how can you get one? Well… at the moment that’s a bit tricky. Green Mountain has the new B40 in stock now, and should have the B70 near the end of this month, though you can place an advance order today. Amazon is taking orders for the new B70 now, for delivery in October. Update: Erin at Keurig tells me that the Keurig web site is stocked up and ready to sell you a second-generation B70 today. Thanks for the note, Erin. Psst… wanna know a secret? So what if you should you see one in the wild, on a retailer’s shelf? How will you know if it’s a first or second-generation brewer? Chances are that you won’t find a first-generation brewer right now… I think the B70 is out of stock pretty much everywhere as it’s proved rather popular. If you do, however, here’s how you can identify the new B70… Take a look at the stainless steel cover for the drip tray. If its center cutout is a circle, then it’s the first generation B70. If it’s a star, it’s a second-generation model. A Follow-up: This may or may not prove useful, as apparently some number of first-generation brewers got the new “star” drip tray, too. On the other hand the retail box for the new brewer now clearly reads that it’s got “new brewing technology”. I have the B70 and have been using it for over 6 Months. It has the Star drip tray. Based on the above this would indicate that mine is the New and Improved model! So, when did Keurig come out with this new brewer? This post suggests that is is something fairly new, whereas mine is over 6 Months old! I’m told that *some* of these brewers entered the market in June. And, I should note, it appears the star in the drip tray is *not* as exclusive to the B70 as I’d been led to believe. While all second-generation B70s do have the star, apparently some of the first-generation brewers got it, too. I’ve updated the note, above, accordingly. I wasn’t aware of any updates to the B70 prior to reading this. We just got one from BB&B last week. I called Keurig Customer Service a few minutes ago, and they told me that if your serial number begins with “70” then it’s the older version. If it begins with “75” then it’s the newer version. I can’t wait to get home so I can check! Okay..I checked. I have the newer model (Woo-Hoo!). My drip tray has a star shape and the serial number begins with “75”. We just got it on 10-30-07 from a new Bed Bath & Beyond store that had only been open for about 3 weeks. I guess they had all new stock. oops…make that 9-30-07. We bought it on September 30, not Oct 30. Interesting….I just called customer service and they told me two versions do not exist. I called because I noticed on my box that it didn’t advertise “Quite Brew Technology”. Knowing about the B40 switch I started to wonder about the B70. That’s how I ended up here. They ackowledged the B40 difference, but denied the B70 difference. Anyway, my box does say “”Advanced Brewing Technology” not “New” as the other points out and my seriel # starts with “75”. Thanks for the help everyone….I hate when corporations try and pull a fast one like this. Scott: I suspect it’s because two versions of the B70 are *no longer* in the market… only the updated B70 should be found on store shelves these days. That would make sense, although I can still find the older B40 at Target for the same price as the newer one. As far as the machine, I was quite skeptical that it could give me a strong, non-bitter cup of coffee…..boy was I wrong. I don’t think I will ever go back to my old maker. Just thought I would give an update. My old B70 that starts with “75” conked out on me and I had it replaced and I was surprised to find this new B70 starts with “76” and not only is it literally silent, I mean you can’t hear it at all (no longer vibrates, just a very low hum), but it now has 5 sizes, a 3.25 cool beverage setting. I thought I would pass it along since this site informed me of the original update. Quite the update if you ask me. I’m happy that I found this blog! Since I’ve had my B70 since Dec 2007 (star drip tray and ’75’ serial #), but no box anymore, all posts here have been very helpful. Mine has been acting up lately, out of warranty, has always been loud, and now it hesitates awhile before it starts brewing. The LCD panel says brewing, but it takes so much longer before the coffee starts to drip. It also looks like less water is in my mug when done. I should pour the coffee into a measuring cup and see for sure, sometimes a light bulb goes off in your head as you’re typing 🙂 I’m considering getting a new one, same model. I’ve looked at the stainless steel model (Breville Keurig BKC600SL), but it looks like the depth dimension is too big for my counter area, but maybe I could put it in a corner of the counter. Either one of the models goes with my kitchen appliances. Any opinions on the Breville model?